Saturday July 23 1910 I am 59 years old today. Will and I drove down town. I stopped at home awhile. got home at 10.30 and got our dinner. Will in town in afternoon I was busy sewing. The heat is something awful. Sunday July 24 1910 I put my peaches away in the pantry and did some extra house-work. I tried to sleep in the afternoon but could not. I wrote some. We did not go down tot he camp to the concert I did not feel well. Went to bed early. 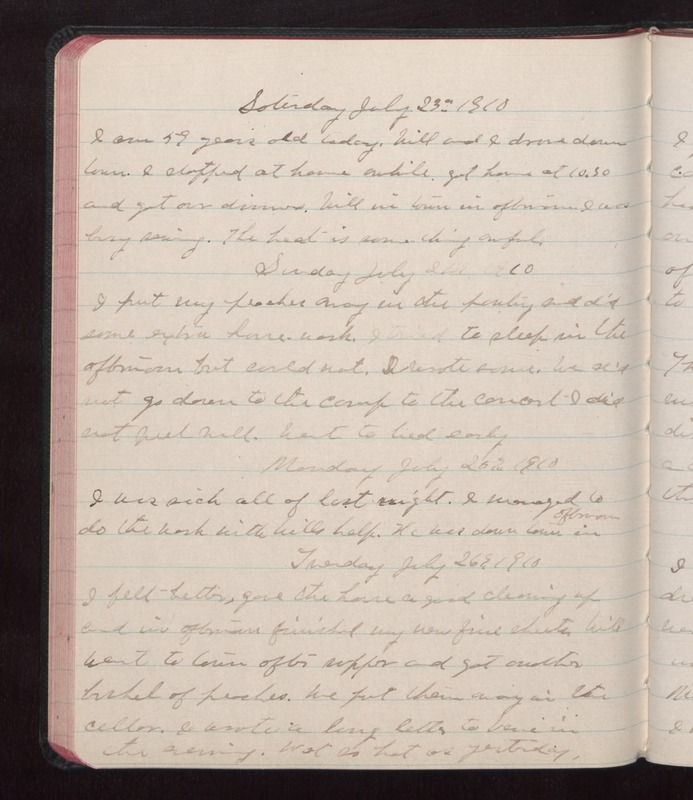 Monday July 25 1910 I was sick all of last night. I managed to do the work with Wills help. He was down town in afternoon Tuesday July 26 1910 I felt better, gave the house a good cleaning up and in afternoon finished my new fine sheets. Will went to town after supper and got another bushel of peaches. We put them away in the cellar. I wrote a long letter to Vera in the evening. Not as hot as yesterday.